Gross Weight (GVWR) 8485 lbs. As the number one RV dealership in Michigan, you'll find the nation's best prices on all of our RV types! Come on down to bring the 2020 Forest River Cherokee 264DBH home! If you're driving through or near Muskegon, stop by 4500 E Apple Ave Muskegon Michigan 49442 to see this Travel Trailer for yourself! To talk about this model with an RV expert, call us at 231-788-2040! Stay protected against the elements while lounging outside with the 15' 0" awning! Tow this Travel Trailer without any issues on the road, with its hitch weight of 884 lbs, dry weight of 6760 lbs, and GVWR of 8485 lbs. It's hard to get a good night's rest when you're on the road. That's why this RV has an extra comfy Queen bed in the master bedroom, so you can sleep like royalty at night! 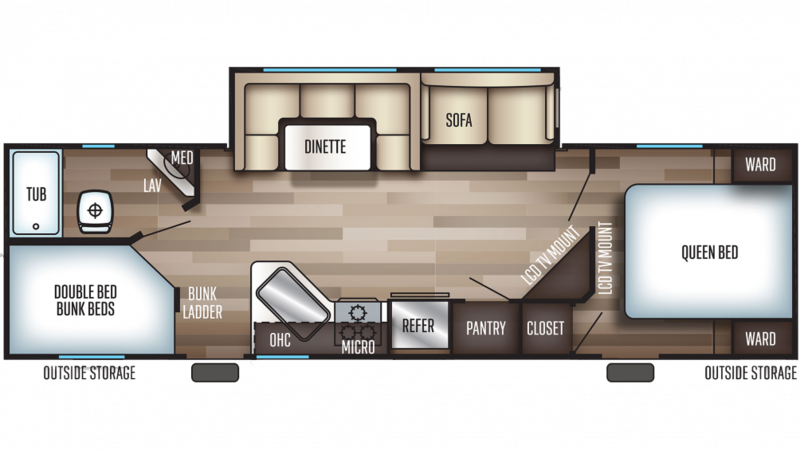 A family of up to 7 can sleep well in this RV! A family of up to 7 people sleeps comfortably inside this Travel Trailer, thanks to the help of the bunkhouse! The comfy Bunkbeds mean kids or guests will get a great night's slumber! Should I buy from a Cherokee dealer near me? We actually encourage you to shop your local dealer. But make sure you talk to us about a Cherokee RV. Visit our dealership, shop online or give us a call to talk about a Cherokee Travel Trailer or 5th Wheel Toy Hauler or Travel Trailer Toy Hauler or 5th Wheel or Park Trailer. We offer the best prices, inventory, and nationwide delivery<sub>*</sub> to your door. What is a Forest River Cherokee? A Forest River Cherokee is a 5th Wheel or Park Trailer or Travel Trailer or Toy Hauler or Toy Hauler sold by RV/Camper dealers in North America. What models does Cherokee provide? Cherokee manufacturered by Forest River has the following models 214JT, 21FB, 234VFK, 235B, 244JR, 255P, 255RR, 264CK, 264DBH, 264L, 264RL, 265B, 26T, 274DBH, 274RK, 274VFK, 274WK, 284DBH, 284RJ, 294BH, 294DBH, 294RR, 29BH, 304BH, 304BS, 304R, 304VFK, 305B, 39BF, 39BR, 39CA, 39CL, 39FK, 39KR, 39LS, 39RL, 39SR, SPECIAL EDITION 39RE. Where can I find a used Cherokee for sale? We often have used Cherokee Park Trailer or 5th Wheel or Travel Trailer Toy Hauler or 5th Wheel Toy Hauler or Travel Trailer in stock. But if you find that we don't have any at present check back or we can put you on a waiting list to be notified when one becomes available. Check out other Park Trailer or 5th Wheel or Travel Trailer Toy Hauler or 5th Wheel Toy Hauler or Travel Trailers as you will find our new inventory competitive in many cases with other companies used prices. Cherokee RVs are manufactured by Forest River.